Boston ICO participated in a Sierra Club volunteer outing at the Club’s Clair Tappaan Lodge near Donner Pass California. Four Zumix participants, Zumix staff member Dan, and Ben spent weeks preparing for the eight-day trip. One of many Sierra Club service trips held annually around the country this was particularly special because other ICO chapters participated. Folks from NYICO and Tampa Bay ICO joined four families as this was a family service trip. The group of 24, including two volunteer service trip leaders, completed many projects at and around the Clair Tappaan and Hutchinson Lodges. We worked on ever-changing participant teams with the lodge’s operations and maintenance staff to prioritize and complete tasks over five work days. From building a new deck out of 1,000+ year old! recycled redwood lumber to building an erecting a bell tower to be used for the ski school to maintaining the Nature Trail and Big Tree Loop (700-year old Jeffrey Pines and a stand of huge shadow-casting Red Firs) behind the lodges the trip offered many ways to serve. Additional work included assembling the ever-developing and vexing puzzle that was eight bunk beds at Hutchinson, planting flowers to brighten up the historic lodge, cleaning up debris left by the deconstruction of the water tower that supplied the amazing redwood lumber for the new deck, and other tasks including dining room chores such as setting the table, doing the dishes, sweeping and mopping. 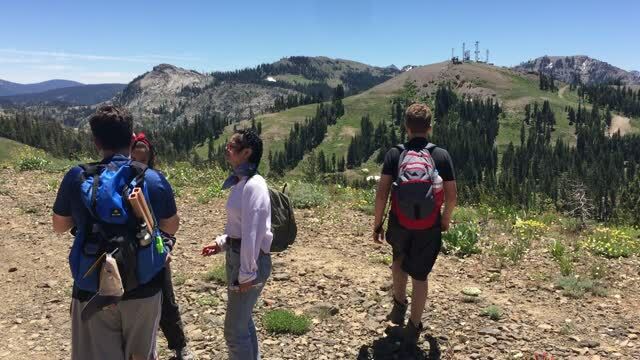 Former Boston ICO volunteer, Breezy who now lives in CA, made the connection for Boston’s participants to use camping gear from a friend’s outdoor guide service in Truckee – thank you Jim Zellers at High Camp! We camped out the final 6 of 8 nights despite Donner Party jokes abound. Early on in the planning we set expectations of cell phone use. The rules were simple: we could use our cell phones for 30 minutes in the morning and 30 minutes in the evening with the focus on communicating with parents / significant others about the trip. We did pretty darn good on this with a few slip ups at the end of the week as the days added up. But overall I am super proud of the efforts with cell phone use / screen time and the overall teamwork, hard work, and focus each of Boston’s participants brought to the trip. As Zumix is a music program we tried a bit to focus on the sounds of the trip and this led to a number of moments of silence throughout – the first when we arrived at the lodge after a long day travelling. The silence was quickly filled with the sound of birds and the breeze through the trees. We knew we had arrived. While at the lodge many folks stopped through – as it is open to the public. A number of Pacific Crest Trail hikers spent a night or two for rest and relaxation. We learned quite a bit about the hiking and experiencing the Sierra Nevada. We also learned about the history of the lodge – being built in 1934 and maintained by Sierra Club volunteers since. It’s a fun spot and I urge everyone to check it out. We learned about John Muir and his founding of the Sierra Club which led to the National Parks System and the US Forest Service. Tom, the trip leader, read Aldo Leopold's Think Like a Mountain. The short essay on natural resources is quite amazing. On our day off we hiked to the Boreal Ridge which afforded a fair hike for all with 360 degree views of the Sierra Nevada. We made our way to a snow patch just off the trail and made a snowman and took aim at a few trees. A swim in Donner Lake on one of the public docks helped cool us down before a nice evening in Truckee. On the final day we traveled through the Lake Tahoe Basin on our way back to the Reno Airport. We climbed Cave Rock and had another moment of silence and recognized how fortunate we were to have this experience with each other.